What do you like best about living where you do? Central to everything, good flatmates, handy to the casino. What do you dislike about living where you do? It’s in Auckland, we are the poorest people in the street! How did you get involved in the mountain bike scene to begin with, and how long ago was that? I had a cousin that used to ride/race back when I was around 10 so I guess I started then. My parents moved to a farm in Woodhill not long after so it kind of kicked off from there. I worked at the bike park for a few years when I was a kid and it’s all history from then. What’s your ‘day’ job? What does it involve? I work at WH Worrall & CO. I mainly do customer service which involves Sprint3, our dealers' online ordering programme and the Worrall’s Facebook page as well (www.facbook.com/whworralls). What are your top five benefits of working with bikes all day every day? 1. You are working with equipment you have time for. 2. You have input into new designs and models. 3. You work with people that are interested in the same things as you. 4. You get to ride sometimes during work time. 5. You see everything in the flesh, not just on the Internet! How would you describe your riding style? Umm that’s a hard one. Well I think I’m pretty smooth and relaxed and a bit lazy sometimes! Favourite trail? Fernhill Loop in Queenstown. What’s one thing you’ve learned in the last 10 years? Treat people with respect and they will respect you. It’s not what you know, it’s who you know! 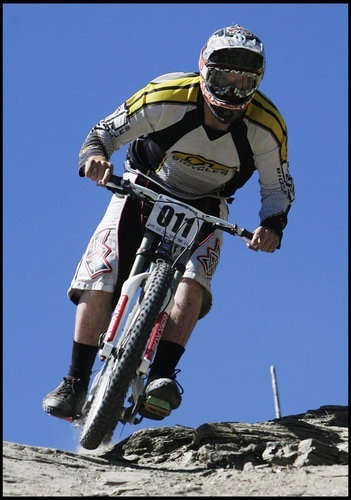 What are three things right with mountain biking? 1. Places 2. 26” wheels 3. Riding! Top two mountain bike developments in the last 10 years (bike park, part or whatever)? 1. Seat Droppers (Reverbs) 2. Queenstown opening up the Gondola! Top five favourite bits of mountain bike kit? Finish this sentence: “On a Saturday I like to get up and….” On Saturday I don’t like to get up, but when I do I like to see it’s a nice day. Recently I’ve been riding heaps on my motorbike so I normally head out for a ride on that. Squeeze a mountain bike ride in the arvo and then do the same the next day, that's pretty much my weekend!